The location of the royal castle was known in the medieval period as Holmen, the Islet. 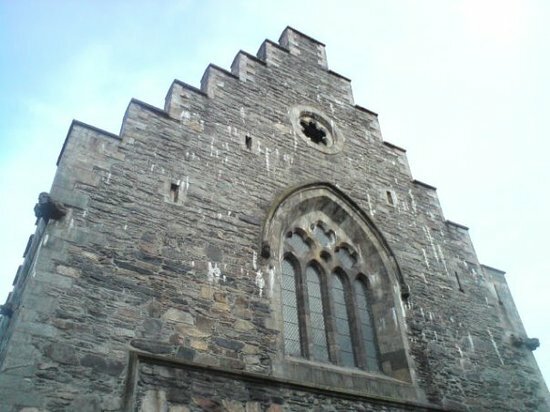 Part of the Bergenhus royal castle - specifically, Haakon's Hall, built by the father of King Magnus. An illustration of Bergen/Bjǫrgvin. Not to scale. Bjǫrgvin, meaning the "the green meadow among the mountains", is the capital of Norégveldi, the Norwegian Realm. Situated on the west coast of the Scandinavian peninsula, in a craggy yet fertile fjord, it is famed for having been founded in 1070 by Olaf the Peaceful. Four years before, the monarch had seen his father Haraldr Harðráði fall in those fateful hours at Stamford Bridge. Although the dream of Norse supremacy over the Christian lands in the west had died (with brief rejuvenations yet to come), the dream of power never died in the hearts of the Norwegian kings. The line of Haraldr fell in the end, after seeing the rule of men like Magnus Barefoot (who campaigned for many years around the Irish Sea) and Sigurd the Crusader (who led troops in battle against Christian and Saracen lords alike). Others replaced it. Today, it is the House of Sverre that holds the throne, and upon it sits Magnús Hákonarson. To the world, he is known as Magnus IV, King of Norwegians, Icelanders, Greenlanders, Shetlanders, Faroese, Orcadians, Bjarmians, Kvens and Lapps, among others... a vassal of the Rex Perpetuus Norvegiae. His diverse empire stretches from the shores of Vinland (where the Greenlanders come to harvest timber) in the west to the White Sea (where the fur merchants ply their trade) in the east, from Viken (a vital border towards the Swedes and Danes) in the south to Svalbarð (or so some say...) in the north. Gone are the days of the Vikings - far from the chiefs and warlords among many of his predecessors, the King styles himself as a continental monarch, having become the first of his line to use regnal numbers. The departure from the Old Norse ways are seen in his diplomacy - he has secured good relations and commerce in return for some concessions to the enemies of old, Scotland and England, in the Treaty of Perth (1266) and the Treaty of Winchester (1269). Even the Swedish ruler is his friend, and the Danes are at the very least not invading. Internally, he is a reformist - the European system of nobility is rapidly entering the country, and above all a new era of law has been entered. In the early months of the Year of Our Lord 1274, he has launched his most important change yet: The introduction of a unified code of laws, which are to apply for the whole country. Prominently, a crime is now a deed carried out against the state rather than the individual, and other measures have been taken to crack down on the ancient customs of blood feuds and vengeance-taking. For his reforms, the people are already calling him Magnus the Law-Mender. It seems like nicknames are unavoidable in this part of Europe. Although his sons - Eric (Eiríkr) and Haakon (Hákon), the result of a surprisingly happy marriage with the Danish princess Ingeborg - are yet young, Magnus knows that he has every chance to make his line a long-lasting one. His kingdom is small and little-known abroad, but it has potential. He just has to play his cards right. A parchment notice is nailed to the wooden gate of Saint Hallvard's Cathedral in the distant Norwegian port-city of Oslo. It bears a finely etched drawing in vivid colours, a rare thing to find outside of the libraries of the monks, depicting the Seal of Oslo. On it, the saint himself is shown, the patron of the city itself who martyred himself in 1043, in defense of an innocent, pregnant thrall woman. They were both slain with arrows, and their killers' attempts to drown his corpse in a fjord using a millstone were foiled through miracle. The cathedral, the first of its type in the far north, is not only the saint's resting place, but also that of Kings like Magnus the Blind, Inge the Hunchback, and Sigurd the Crusader. 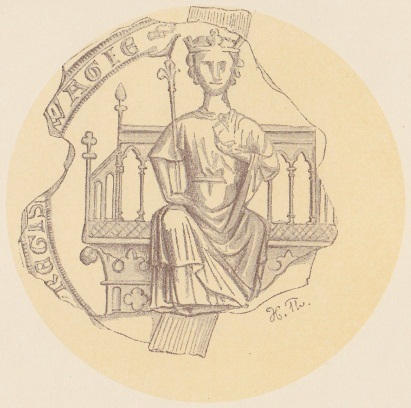 IN THIS THE YEAR OF OUR LORD 1274, LET THE DEEDS OF KING MAGNUS BE KNOWN TO ALL. All those Faithful who wish to travel the Pilgrim's Route, that most Holy of all roads in the northern lands of Christendom, shall find that they are aided by powers both Spiritual and Temporal in their endeavor. No longer will the humble Pilgrim find himself in want of shelter, nor be chased in the dark by neither outlaw or beast. Magnus, the Fourth of His Name, King by the Grace of God, has decreed that several barrels of precious metals from the Royal Treasury will be put to use in making the Pilgrim's Route a safer and more prosperous path, where Peasant, Merchant, Priest and Knight alike will find refuge. Additional mountain stations and roadside taverns are to be erected, at the King's private expense, and the Route is to be clearly marked by standing stones bearing the Cross of the Lord. Sustenance and warmth will not be lacking for those that seek to travel from the Cathedral of Oslo to the heart of our Archdiocese, the Cathedral of Niðaróss. No living Soul in Norway, Sweden or Denmark shall be denied the right to gaze upon the Relics of Saint Olaf the Holy, the King who brought Christendom to these lands. The Saint-King, he who was the blood kin of Saint Hallvard of Oslo, embraces all those that are of Faith. Any man that harasses a Pilgrim along the Route shall be fined five silver coins on order of the King. Any man who lays hand upon a Pilgrim will lose the hand, for it is a Sin to interrupt and rob those who seek Redemption. So be the will of the King, and of the Lord. WRITTEN IN THE NAME OF THE REX PERPETUUS NORVEGIAE. It's not quite the evening yet, but the Court has receded to their a various chambers, on this day of rest. In the royal study, a heavy-set man cloaked in brown approaches Magnús Hákonarson, fresh from the sea-road. The King allows his glance to leave the biblical manuscript before him, illuminated in dark red and green by the monastic masters of the continent. "Take care that you utter no curses in my presence today, merchant. It is the Sabbath, after all." A wide smile is hidden beneath a heavy bow. "Wouldn't dare, your majesty". The last time they met, the man nearly beat a servant to death, then made a lewd remark about the Pope - all in front of the royal heir. Still, even a brash savage can have his uses. "What tidings do you bring from my 'kin' in the east, then?" Another wide smile in response, no longer hidden. "Nothing good, my liege."